Y’all know how much I love my “heritage” recipes. This one of the absolutely best of those. Just chock full of childhood memories – Egg Custard Pie. I’m not absolutely certain that this pie is strictly a southern heritage recipe, but it seems so to me. Maybe that’s just because it has always been one of my favorites. Now, if you’re looking for one of those “mile high” type pies that’s rich and extra sweet, then this pie is not for you. But if you want a luscious, creamy treat that is perfect after any meal, I have your recipe right here. This is really nothing more than egg custard baked in a pie crust. It has the richness of whole milk and eggs and the perfume of a dusting of nutmeg but it is not overly sweet. If I had to choose my favorite pie, it would be difficult to choose between this one and a coconut meringue, but I think the egg custard would win. This is the simplest recipe that I know for egg custard. Lots of recipes require the milk to be scalded and gradually beaten into the egg and sugar mixture and I’ve made it that way many, many times. But, I have also found that it doesn’t make much difference at all whether the milk is scalded or just added right into the eggs and sugar. I can’t tell the difference in the finished pie and skipping that scalding step makes this recipe go so quickly. I’m all for fewer steps and less time making dessert. In fact, you can make this pie up in less than five minutes, pop it in the oven and have a lovely dessert baking away while you cook dinner. Start by preparing the pie crust. Now I won’t go into it all over again, but just suffice it to say that homemade pie crusts and I are not friends. We’re barely on speaking terms. Homemade pie crust hates me and the feeling is pretty much mutual. So, I’ll start with a frozen crust which I have thawed according to its package directions. Prick the crust all over with the tines of a fork. Lightly beat an egg white and brush it all over the unbaked crust. The egg white will help keep the crust from becoming soggy. And for some reason, I always think egg custard is best in a regular crust instead of a deep dish. It just seems more old-fashioned and that fits perfectly with this pie. Preheat the oven to 400 degrees. Set the crust aside while you prepare the custard. In a medium bowl, add the beaten eggs and egg yolk, the sugar, salt and vanilla. Mix those together a little and then whisk in the milk. Put the prepared crust on a baking sheet and then pour the custard into the crust. You will probably have a bit left over just like I did. You can cook that up in two little custard cups. 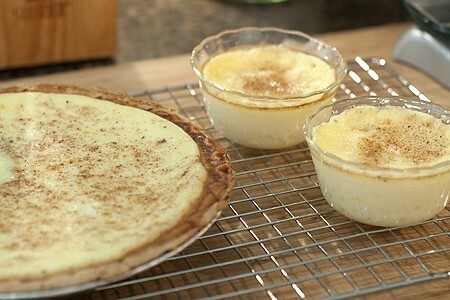 It makes two delicious little treats for the cook :-) Dust the top of the pie and custard cups with nutmeg. Carefully place the baking tray into the oven and let the pie cook for 30 to 35 minutes. Check to see if your pie is ready by inserting a knife near the center. If it comes out clean, you’re all set. Remove the pie (and custard cups if you used them) to a cooling rack. Serve at room temperature and refrigerate any leftovers. Occasionally I serve a spoonful of very lightly sweetened whipped cream alongside my Egg Custard Pie, but I think it’s really perfect all by itself. 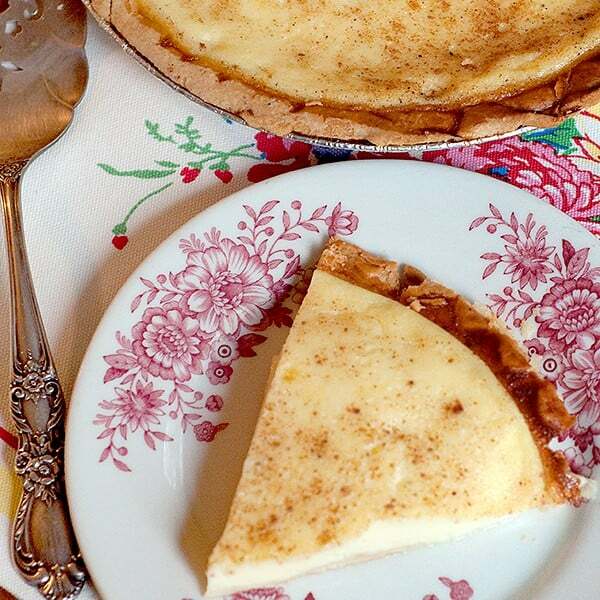 Old-fashioned egg custard pie with a dusting of nutmeg. If using a frozen pie crust, allow it to thaw at room temperature according to its package directions. Prick the crust all over with the tines of a fork. Brush thoroughly with beaten egg white. This helps prevent the crust from becoming soggy. In a medium bowl, add the beaten eggs, sugar, salt, and vanilla. Beat together. 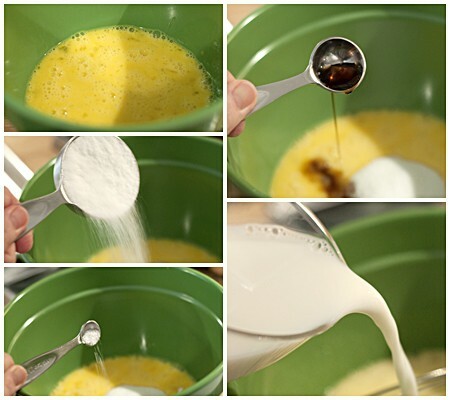 Using a wire whisk, add the milk. 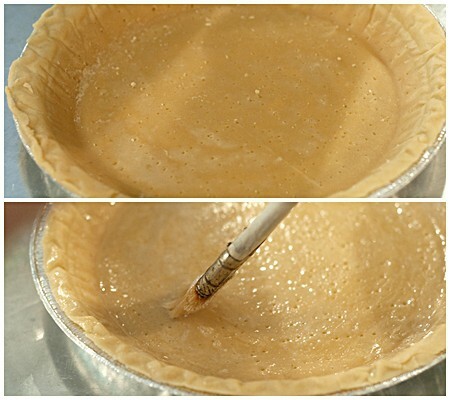 Place the prepared pie crust on a baking sheet. 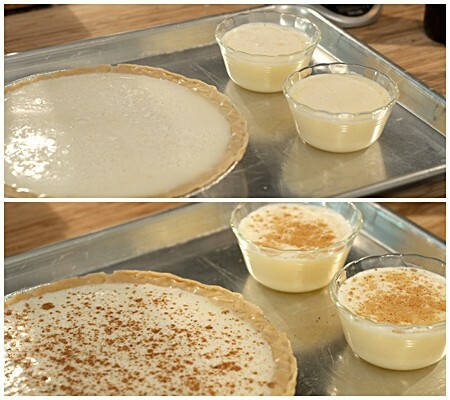 Pour the egg and milk mixture into the pie crust filling baking cups with any excess mixture. Bake for 30-35 minutes or until a knife inserted near the center comes out clean. May be served either cold or at room temperature. I love that treat! Your pie looks gorgeous. I love those little treats, too, Rosa. I want!!! Your pie looks AAHHHH MAZING!! Yum! Thanks, Heather. It’s been one of my favorites for as long as I can remember. I am sure I’ll love this, it looks wonderful, delicious and irresistible! My first neighbor in North Carolina made an egg custard pie for us. That was more than 25 years ago. Sounds heritage to me. Loved it then, still love it today. Me, too, Barbara. Amazing that something so delicious can result from the most ordinary of pantry and refrigerator staples. 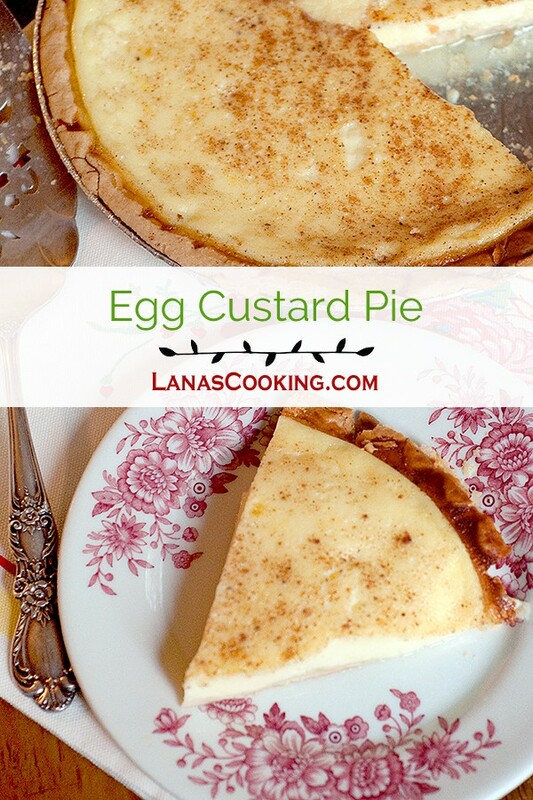 I love custard pies–this looks beautiful, and I love the little “side treats” for the cook. Sounds absolutely delicious – I’m loving all the Southern recipes! Thanks! I’m loving sharing them. I’d be happy to do “requests” if you have one. Egg custard pie is my papa’s favorite — so it’s always on the dessert table at Thanksgiving and Christmas. I love it, too. I also love it’s cousin – buttermilk pie! :) Thanks for sharing! I haven’t had a buttermilk pie in ages! Need to find a good recipe for that one. Thanks for reminding me. hey, I all for the ease of things too, glad to know about the scalding… reckon it’s the same with caramel??? naught might try that, I am so bad about ruining a good thing…. This looks heavenly Lana love the custard and photo is perfect! Lucious and creamy sounds great to me! This reminds me of a pie my mom used to make when I was younger. This looks really tasty. I love egg custard! I think most people do like egg custard, Curt. It has a really comforting quality about it. This looks wonderful! I was supposed to go to South Carolina this weekend but it fell through so maybe I’ll channel the trip with some Southern style cooking! Everything about this pie is lovely. I’ve had chess pie but not egg custard. This looks so easy to whip up and a nice complement to the more traditional pies that sit on the Thanksgiving table. Thanks for sharing it! This is somewhat similar to a chess pie, except that it’s much, much less sweet. I think that’s why I prefer the egg custard. The pie does look so “heritage” with that darling plate and placemat…you have set the mood nicely for that! I love egg custards from pot au creme to creme brulee, so I think this will be amazing! Thanks…. I am always SO leery of people’s egg custard pie recipes, but YOU I trust!!!! This looks perfect in the photos, it looks like EXACTLY how I dream of the pie I want to consume to look. And since it’s coming from you the recipe I trust completely!!! Oh sweet baby jesus I think I can finally make a egg custard pie!!!! You’re welcome, Jessica. Hope you enjoy it. This is the pie for me! We all love baked custard and I love it in a pie. Just really perfect. Like so many other commenters, I know I have eaten something like this long ago and just hearing the name and looking at the photos pricks a memory. I love it! Such a lovely pie – this would be a winner with everyone I know! Lana, my maternal grandmother dressed this up a bit and it was my favorite dessert. She called it a three story pie. She put stewed dried apples in the bottom of the pie plate, then poured egg custard over that and baked it. Finally, she added a meringue on top for the third story! Oh, my that was southern Alabama and just delicious! That’s a new one on me, Glinda! But it sure does sound interesting. Never heard of three-story pie before. This looks beautiful! reminds me of a pie my grandma used to make. I absolutely adore custards of all sorts. You got it down to a science here Lana. BTW you are my kind of alady I don’t lik emy desserts too sweet either! I think that’s the reason that I really don’t eat desserts that often – I don’t like anything too sweet. This pie has such a mild, slightly sweet taste so it’s one that I do enjoy. I bet this is delicious and not too sweet (my preference)….there is nothing like whole milk in a recipe, sometimes reduced fat just won’t cut it! You’re so right! Sometimes you just have to use the whole milk to get the smoothest, richest result. Thanks for this, been looking for a long time to find a recipe like this. I don’t mind even if it’s not “Southern heritage” it looks great. Can’t wait to give it a try this weekend. Hope you enjoy it, Sarah. YUM. This topped with fresh berries and I’d be in heaven! The pie looks amazing! Can 2% milk be used and get the same effect as whole milk? Shunti – It would probably be close. However, you don’t get the *exact* same result with 2% since the fat content is lower. Yes! That’s correct, Lillian. Thanks for pointing it out. I’ll correct the post for the oven temp. I’m loving your heritage recipes! Good ‘ole southern food speaks to my roots – and my tummy :) Keep ’em comin’. I am all for taking shortcuts that make sense, and skipping the scalding to make the custard makes so much sense that it’s hard to argue against NOT making this amazing looking pie!! A wonderful tip about skipping the scalding…makes it a much easier dessert to whip up! I grew up on egg custard! I loved it and no one’s made it in ages! It’s weird how as a society we cycle through food like fashions. I must make egg custard this year! I made this pie today, and it is delicious. I remember my great-grandmother making custard pies in her wood-burning stove. Luckily, mine is electric, but the pie tastes just like hers did. Some egg custard pies are too watery, but your recipe is perfect. Thanks for sharing! I am looking for a recipe for crustless egg custard pie. Do you happen to know of a recipe. Hi Vicky – I’ve never made a crustless egg custard pie so I did a quick Google search and it turned up over 22,000 recipes for that! However, I can’t vouch for any of them. Good luck finding just the right recipe! This tastes awful. I made this and it was too eggy tasting. I followed the recipe and thought from all the ‘oh this is awesome’ comments, that it was going to be amazing…. no. I’m so sorry you didn’t like the recipe, Kelly. I make it quite often and we always enjoy it. It is, after all, an “egg” custard so it will taste of eggs. Maybe you were expecting something else. You definitely want to use whole milk for this pie, Hanah. Hope it turns out good for you! Good!! I followed the recipe and directions!! We shall see! I’m so glad to know that you enjoyed it, Tammy! It always reminds me of my childhood. It’s me again, Tammy, I have now made this pie several times for friends and family. They absolutely Love it. I just wanted you to know I have shared your recipe with lots of loved ones. Thanks again for this wonderful recipe. Have a blessed day !! I made this pie using a recipe identical to yours (though I found it on another site). I followed the recipe to the letter, but the filling didn’t set up. Do you have any idea what might have gone wrong? I can’t imagine, Lisa. I’ve made this pie hundreds of time in my life and never had that problem. The only possibility I can think of would be if you just didn’t cook it long enough or if your oven temperature was way too low. I made this today. I did NOT scald the milk and my pie still did not turn out smooth! It was like scrambled eggs. I also had my oven set at 400 but I had to cook it for about 1 hr before the knife came out clean. Do you have any recommendations? Thank you. I did use 2% milk if that had anything to do with it. Nikki – unless I was right there in the kitchen with you when you were making the pie, it’s really hard to say what went wrong. Two things to check are that you beat the eggs thoroughly so that the yolks and white were very well mixed and that you used whole milk. I’m not sure 2% would have quite enough for a proper custard. Also, check your oven temperature with an oven thermometer. It could be off. I made this pie tonight. It’s easy and delicious!!! This is by far the best egg custard pie I have made. It was scrumptious. I will use this recipe from this day forward. Thanks for posting this on your website. Oh and I love your website. Keep up the good works. Maybe some of you have used 2% milk or lactaid milk, but I have never had the recipes to turn out right using them. I also put the pies in a pan of water while cooking. It seems to make the custard much more creamier. Made this pie and it turned out delicious. I have tried using lactose free and 2% milk but the pies have not turned out very well compared to using whole milk. I also use the deep dish pie crust, put the pie into a shallow pan and add water to the pan while it is cooking. Love this recipe. Thanks for the great recipe. That’s the pie on which we grew up. We made it lots and lots of times. The beauty was that even crazy kids could make the thing, and it would turn out beautifully and taste great. Still is the beauty of the pie. I have the same inappropriate disdain for pie crust. Not only do I not make the stuff, I really don’t care for the taste. So, get one of those “roll it out” crusts out of the refrigerated section, and put it in a really good looking pie plate. It looks homemade, and folks who like the crust think that you went to great trouble. Thanks for linking to the Blueberry Custard Pie! Your Egg Custard Pie looks amazing. Am making this for New Years Eve and so used egg nog instead of milk. Fingers crossed.